When you spend a lot of time in a 150 square foot travel trailer like Birdy, you get a lot of family closeness. This may come in the form of stepping on each other as you get dressed and brush your teeth, or it may come in the form of gathering around to play a game. 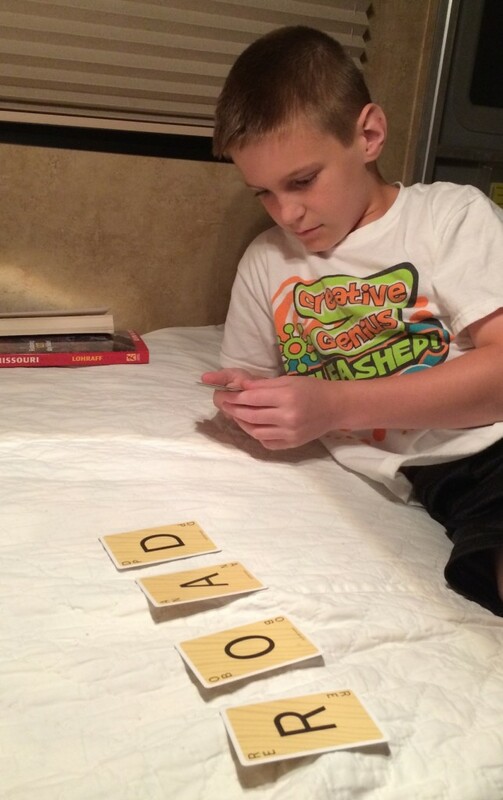 Concept: As soon as your kids can spell lots of short words, they can play Scrabble Slam. Each person starts with a handful of cards with letters on each card. A 4-letter starter word is decided upon, and each player slams down letters to change the word to a new word as quickly as possible (for example, FATE becomes MATE becomes MAKE and so on). This is perfect for 2 or many more players. If you’re playing with a younger player or slower player, you can alternate turns instead of slamming letters as quickly as possible. Portability: Scrabble Slam is a card game, so it takes up very little space. Appeal: We love how quickly this game goes. You can play a round in a minute or less and play as many or as few rounds as you want. It’s also educational if you have little ones who are starting to learn to spell. Concept: Each player has cards with familiar people, places, and things. The judge for the round turns over a card with a theme, and each player tries to find one of their cards that best fits the theme. Themes can include things like Most Dangerous, Disappointing, Claustrophobic, Fun, etc. The judge decides whose card best fits and then that player becomes the next judge. If you are playing with little kids, you might want to get the Junior set since not all of the terms are family friendly. I remember an awkward round where our 6-year-old was judging which term was “sexiest” while playing a game with us and his grandparents–ha! 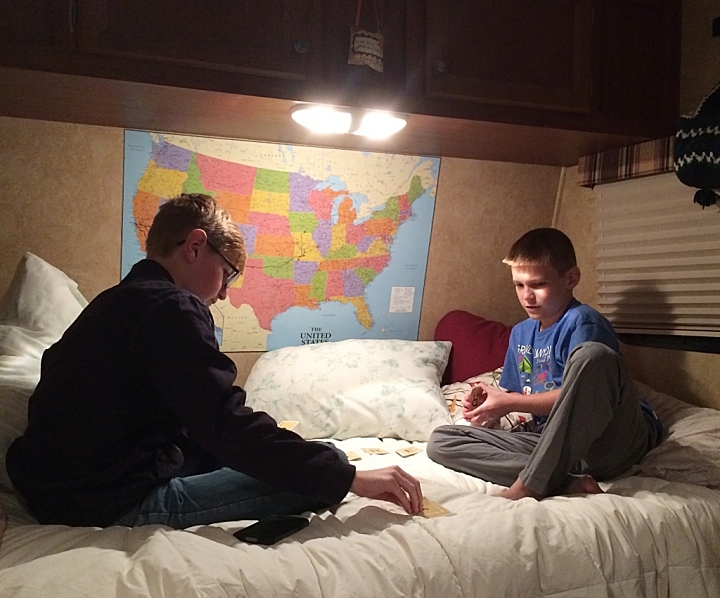 Portability: Our Apples to Apples set came in a large box, but to carry it in the RV, we just pull some cards out and put them in a plastic bag. You can instead buy a travel edition. 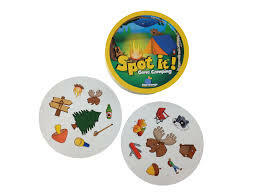 Either set is good for the RV because there are no little pieces to lose. 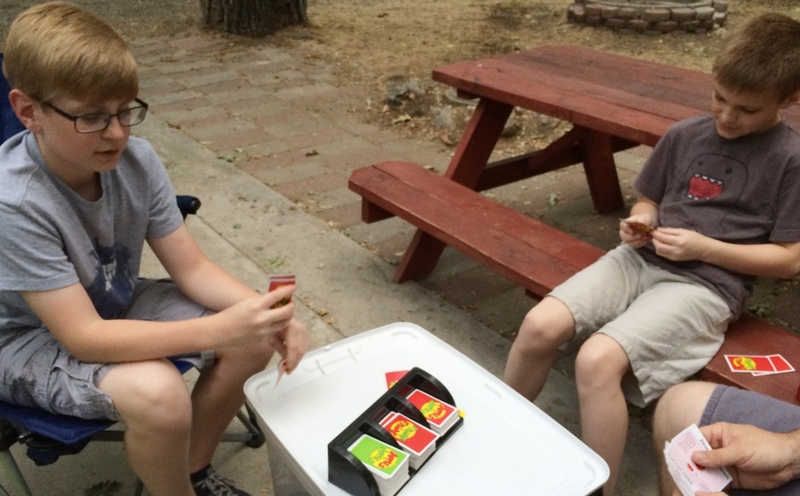 Appeal: Our sons love Apples to Apples because they think it’s really funny and random. I like that it is a thinking game but not a strategy game. Your kids will come across plenty of words and concepts they aren’t familiar with, so you get to tell them a little about the world, and they’ll have fun trying to convince the judge that their card really should be the winner. We all end up laughing a lot while playing Apples to Apples. Concept: To play Spot It, you’ll turn over two cards and the first person to spot the matching symbols on the cards wins the round. Your brain will hurt from trying to figure out how in the world each pair of cards has one, and only one, set of matching symbols. Portability: These come in a small, round tin container. Ultra portable! Appeal: Our boys are slightly past the prime ages for Spot It. I think it would be best for 5-10 year olds. However, this is a clever, quick game with lots of family appeal. There’s also a Gone Camping Spot It set that would be perfect for RVing. For older kids, the Hip Spot It set might be fun. You can read about 3 of our favorite non-card games on this post. So, now that you know our family’s favorites, what games does your family enjoy? The Meyer family camped in a tent when my brothers and I were young. Dad taught us all to play Pitch. We started out playing five point, the graduated to ten point when we were older. 50+ years later I still remember marathon games and all the laughter that ensued. Wow these look like such fun games!